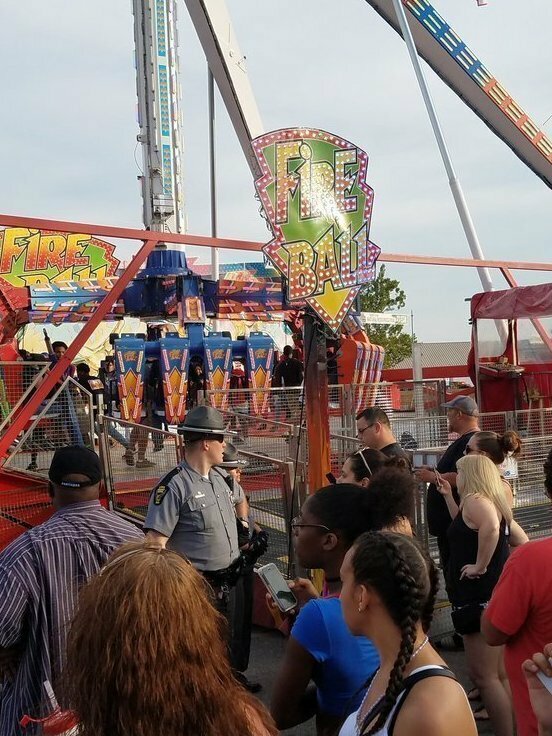 Ride Malfunction At Ohio State Fair Kills 1, Injures 7 : The Two-Way Columbus fire officials say some of those injured were thrown from the ride. Gov. John Kasich has ordered all fair rides shut down until they can be inspected. People watch as authorities respond after part of the Fire Ball ride broke off while in motion Wednesday night at the Ohio State Fair in Columbus, Ohio. One person was killed, and three were critically injured. One person was killed and seven others injured, including three critically, Wednesday evening when they were ejected from a ride at the Ohio State Fair. Video posted online appears to show part of the Fire Ball ride detaching before people drop out of their seats to the ground. Their names have not been released. Michael Vartorella, who is in charge of inspectors for the state Department of Agriculture, which is responsible for safety checks, said the Fire Ball and all the rides had been inspected several times before being certified to operate. Vartorella told reporters, "My grandchildren ride this equipment." He said that the inspectors "don't rush" through the checks and that the fair opened for business Wednesday without 11 rides that hadn't passed inspections. Some of them were approved during the day. Gov. John Kasich has ordered all rides at the fair shut down until they can be inspected again. "On its website, Amusements of America says that since its debut in 2002, the Fire Ball has become 'one of the most popular thrill rides on the AOA Midway.' The company description of the ride says it swings riders 40 feet above the midway while spinning them at 13 revolutions per minute."